Samsung S5380 Wave Y packs the latest version Webkit-based Samsung Dolphin Browser, which resembles the one found on Android. Yes, we know we said that before. Once the page loads, all you see is the URL bar and the refresh button on a line at the top of the screen. Once you zoom in or pan around though even that line disappears (scroll to the top or press menu to bring it back). You can pinch zoom in/out or use double tap. There is kinetic scrolling too. Text reflow is not available. Bada 2.0 offers Flash Lite support and some of the banners showed up, although we couldn't get embedded videos to play. The Dolphin browser also offers a download manager and a search-on-page option. If you tap and hold on a chunk of text you'll get the usual selection tools, along with copy and translate. The Wave Y comes with its own Calendar app, which offers three different types of view - daily, weekly and monthly. Adding a new event is quick and easy, and you can also add locations, participants and set an alarm to act as a reminder. The Wave Y features a decent alarm clock application, which allows a huge number of alarms to be set, each with its own start time and repeat pattern. It also hosts the world clock, stop-watch and timer functions. There is also a calculator aboard. It is nicely touch optimized - the buttons are big enough and easy to hit. Samsung have included the My Files app - a simple to use but functional file manager, which also doubles as an image gallery. It can move, copy, lock and rename files in bulk, even send multiple files over Bluetooth. The Memo, Tasks and Voice Recorder are self-explanatory. Social Hub is the messaging and media sharing service - this one app allows you to create a message (it may pack media content too) and then send it to various services - SMS/MMS, email, social networks. The Smart Search, which can be added as a widget in your Live Panel, works on everything in your phone - contacts, images, music, videos, emails, history, apps, etc. It works very well and helps when you have lots of content. It also offers internet search with Google or Bing. 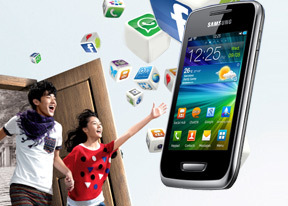 The Bada OS offers a native application repository from the start - Samsung Apps. Samsung Apps is very similar to the Android Market. It has three tabs - featured, top and category view. There is also a download section and search option. The Samsung Apps store is expanding fast, although we can't say the same about its quality. Still, there are thousands of apps inside, so you'll probably find at least a few useful tools and fun games. While Samsung App store's growth is impressive, it is far behind Apple's App Store, Google's Android Market or even the Windows Marketplace. There is also a music store called Music Hub. Its functionality is pretty much the same as the iTunes store - you can use it to buy single tracks or entire albums.